Posted September 27, 2017, in Events, Seminars. The last decade has seen significant growth in the numbers of, and interest in, forms of ownership that have been variously called, “solidarity economies” or “alternative economies” or “non-capitalist economies.” While there is a lot written about these efforts, there is relatively little that has explored the lived meanings for those involved in such endeavors. The paper will ask how participation in forms of ownership that are different from the norm in American society impacts the political understandings and meanings that are attached to those forms of ownership. In short, does being part of such a form of ownership have political meaning to participants? If so, what are the meanings and how can they be properly understood by those looking to these forms of ownership to be part of a larger socially transformative movement? Drawing on scores of interviews with community land trust (CLT) residents, staff and board members, foundation and government funders, and others, this paper will discuss and analyze the reality that for most of the participants in such endeavors, the political meanings are muted, under-explored, and often fairly minor. It is this contradiction; between the significance of the change in the ownership form and the relatively insignificant political meanings attached to that changed ownership that this paper will probe. It will do so in order to better understand the political potential and limitations of “solidarity economy” forms of ownership, and to realistically assess what can be expected of these forms by those who aspire to have a more just political economy. James DeFilippis is a Professor of Urban Planning at the Bloustein School of Planning and Public Policy at Rutgers University. He has a PhD in Geography from Rutgers. He is the author or editor of six books, and has written more than 50 journal articles, book chapters, and policy reports on issues of community development, community organizing, urban politics and policy, affordable housing, labor, and immigration. Page last updated by CURE at 2:45 pm January 9, 2018 . 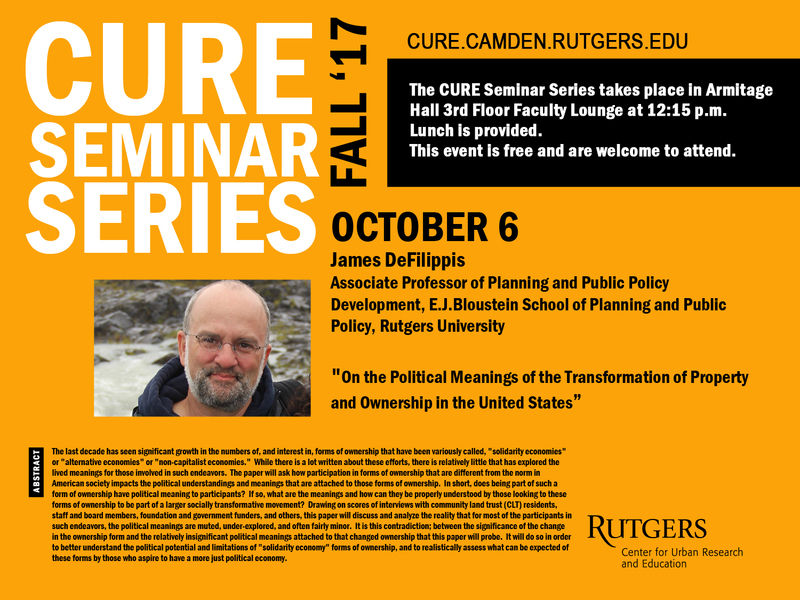 This page was printed from http://cure.camden.rutgers.edu/2017/09/27/cure-seminar-series-on-the-political-meanings-of-the-transformation-of-property-and-ownership-in-the-united-states-with-james-defilippis/ at 8:27 AM Saturday, April 20, 2019.